4 Eating less animal protein. Animal protein increases the amount of calcium, oxalate, and uric acid in the urine. 4 Increasing the fiber content of the diet, which can reduce urinary calcium excretion. Diets high in fat and salt and low in fiber increase risk of developing stones. 4 Reducing caffeine intake, as high intakes increase calcium excretion into the urine and may promote stone formation. 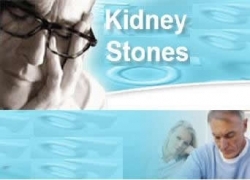 Heavy alcohol consumption also increases the chance of developing kidney stones. 4 Drinking plenty of water and other fluids, which increases urinary volume and decreases the concentration of stone-forming substances. Drinking at least 2 l of fluid throughout the day. Because vitamin C can be metabolized to oxalate, it has been suggested that high intakes of vitamin C might increase risk of kidney stones. However, oxalate in the urine generally does not increase unless the daily dose of vitamin C is greater than 6 g, and even then only rarely. In individuals susceptible to stone formation who are taking high doses of vitamin C, supplemental vitamin B6 and magnesium can reduce risk of increased oxalate in the urine.